I’ve been reading Edward Abbey’s Desert Solitaire of late. It really is a fantastic book—my first experience with Abbey, who has long been on the intended reading list. It also is making me miss the Utah and Arizona desert landscapes. I have a soft spot for them in my heart, harkening back to the year I spent living in Arizona, from the summer of 1996 to 1997. I fell in love then and continue to love it today. I thought I would be visiting Arizona again this year, at the beginning of April, but that plan has fallen through. Partly this is good, for a private reason, but it also partly is a shame, as my reading of Desert Solitaire has left me with a strong desire to see the desert again, even if it was to be a different part than the one Abbey is writing about. I am a blessed person, though, and I have seen the areas that Abbey writes of, though certainly not as he saw them. 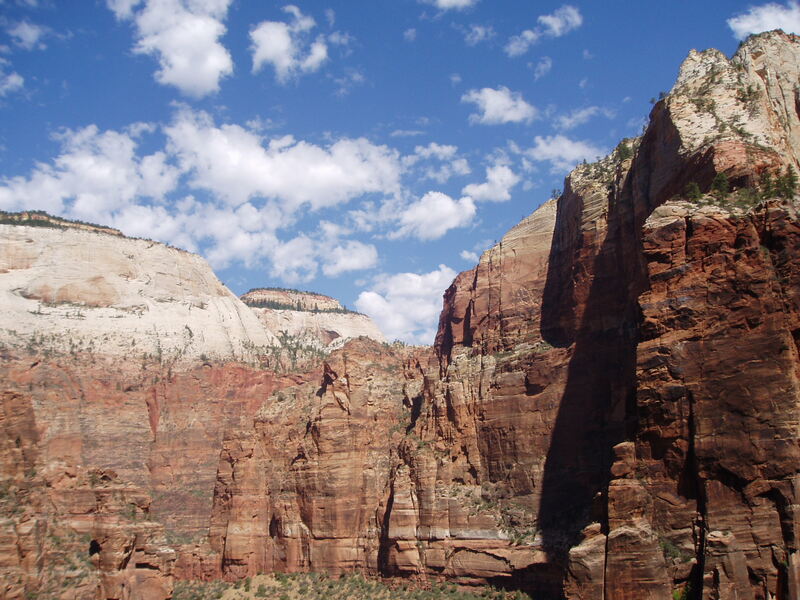 Back in 2004, I took a long road trip through multiple National Parks, with the bulk of that trip spent in southern Utah, at Arches, Canyonlands, Bryce Canyon and Zion. Abbey has evoked memories of that trip multiple times. In lieu of a visit to the desert—and in need of an update to this blog while I mull a lengthier post to be published, hopefully, by Monday—I place here for your enjoyment a few pictures from the Utah portion of that trip. These pictures don’t begin to do the landscape as much justice as Abbey’s words do, but they evoke my time actually there, within this landscape, amongst these rocks and cliffs and trees, and so they’ll work for now as a small echo of reality. This is part one. Part two will come later. The cliffs in Zion really are quite spectacular. I love the clouds in the sky that day, as well. 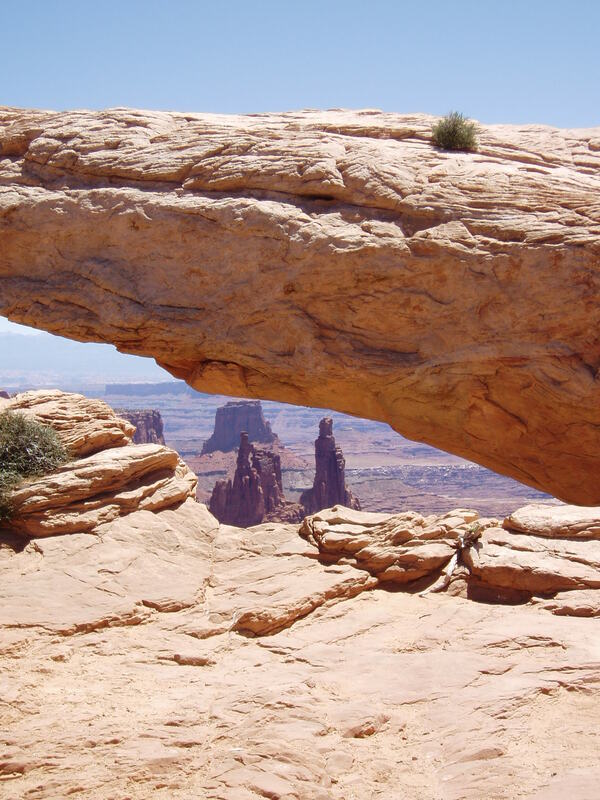 Mesa Arch in Canyonlands, the landscape stretched forever behind it. 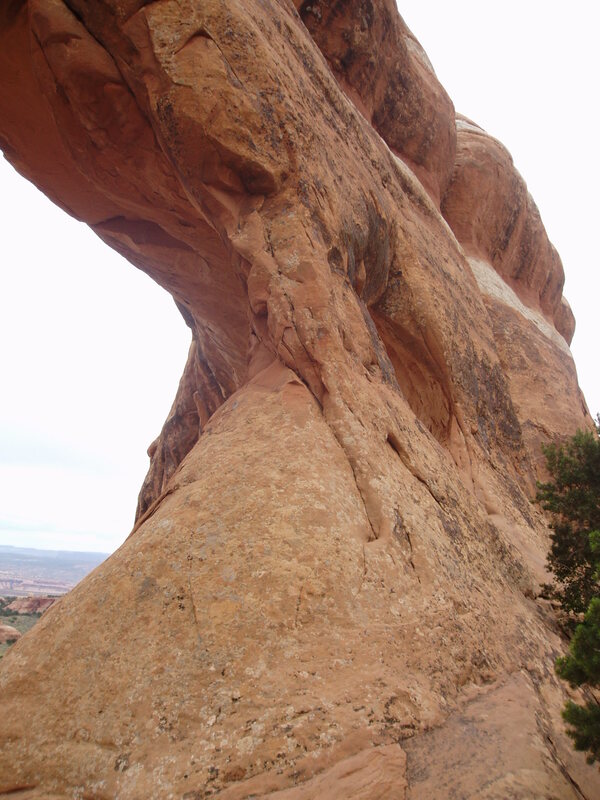 A side shot of Navajo Arch. I find the erosion pattern reminiscent of musculature. 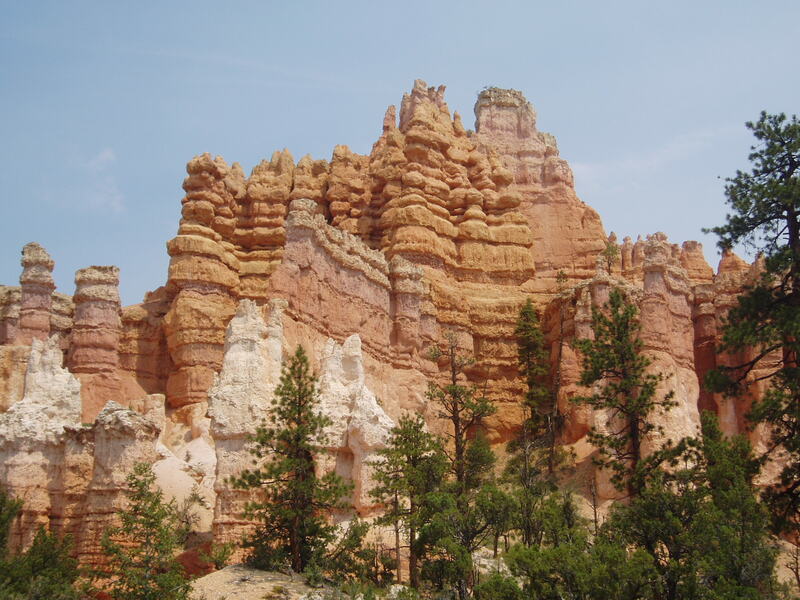 Some of the hoodoos in Bryce Canyon, looming against the sky. I love erosion. 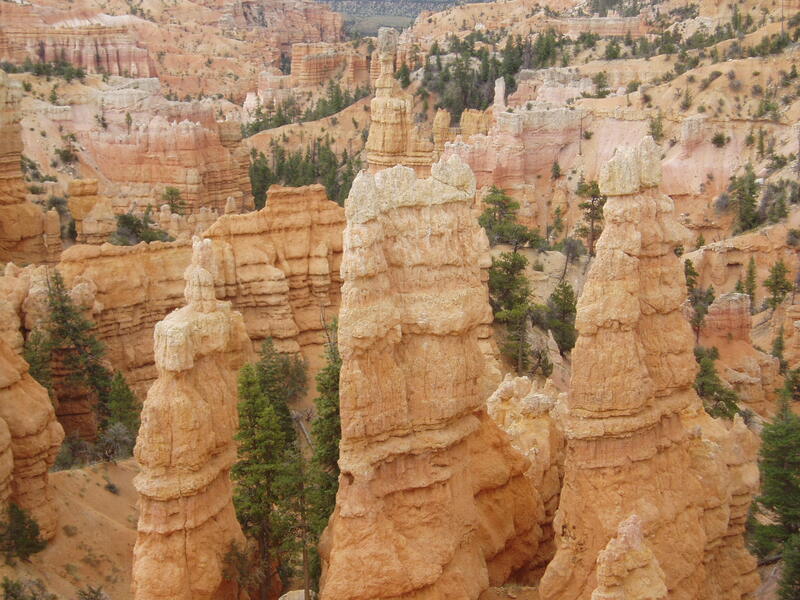 Yet more hoodoos, extending off into the distance. I just love this tree against the sky. I have a thing for cool trees framed against the sky. 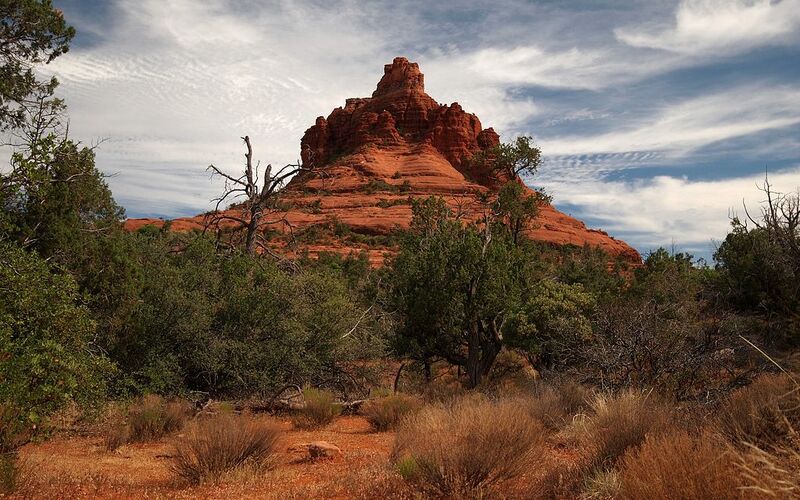 Six weeks ago, I walked amongst the red rocks surrounding Sedona, Arizona. I was in Sedona after having driven my mother there and was able to take a few days to enjoy the local landscape, to sit in the sun and read, to walk in the desert and reconnect to a place I had visited once fifteen years before, when I lived in Arizona for a year. 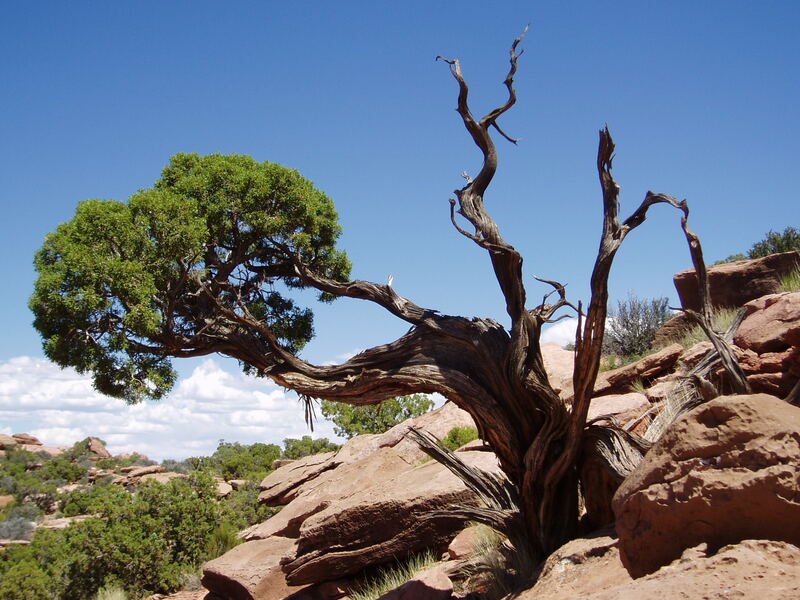 Ever since that year, I’ve felt a connection to the Arizona desert landscape and didn’t hesitate to take advantage of the chance to return to the state. Bell Rock. Taken by Ken Thomas. Twice while there, I walked the trails looping around Bell Rock and Courthouse Butte, winding my way across the red sandstone and between the twisting Junipers, the trail dipping down into washes and scaling rock outcroppings. On February 4th, I skirted around Bell Rock and took Llama Trail, which meandered away from Courthouse Butte. I lost myself in the rhythm of the hike, my breath syncing with my steps, the landscape unfolding around me. A bounty of birds flitted about in the branches of the surrounding Junipers—which were short and squat, hunkered down low to the ground—and I would stop on occasion to watch them for a few minutes, their quick and jerky movements mesmerizing. The day was a bit cool, the temperature in the fifties with clouds passing overhead. The sun peeked out at times but proved hidden more often than not. As I traversed farther along Llama Trial, the passing clouds turned dark and borderline foreboding, kicking up winds that suggested an oncoming storm. Climbing up and out of a wash, I crested a small hill and came out the other side of a stand of trees, looking upon a wide expanse of red sandstone marked with small cairns. Off to my right, nearby cliffs towered high, as red as all the other rock and dotted with trees. Beyond the cliffs stretched the sky—and a series of heavy clouds promising rain. I carried a rain jacket in my backpack but no other rain gear. I hoped that any rainfall wouldn’t be too heavy. In the middle of that stretch of sandstone sat a pair of large rocks, one of them perhaps three feet in diameter and the other a bit smaller and higher. A cairn balanced upon the smaller rock. I walked over to those rocks as an increasing wind stirred around me. From the vantage point of the two rocks, I saw a series of shallow pools forming a line in the sandstone, the worn cavities holding stagnant water from the previous rain. I dropped my backpack on the ground, next to the larger rock, and then went to one of the cavities, kneeling to inspect it. A dead scorpion caught my eye at that moment, its dried husk of a body perched on the rock about a foot from me. Just as I focused on the scorpion, a rain drop hit the stone right next to it, creating a sudden and surprising, tiny burst of darkness. It startled me. I glanced up at the dark sky and then over at the cliffs to my right. There, a mist in the distance—a fuzzy opacity in front of the cliffs. Rain falling. Moments later, more rain arrived, increasing in scale and intensity. The rain patterned the rock around the dead scorpion. Ripples spread in the small pool of stagnant water. What am I to do in places like this, at such moments? I considered this as I retreated back to the pair of large rocks, toward my backpack and rain jacket. The wind grew stronger and the rain continued to fall, insistent but not overpowering, not yet drenching. I wondered how long the storm would last and how strong it would become. I could have retreated at that moment, beating a path as quick as possible back to the parking lot, but even that would have been something of a futile effort. I had no car at the parking lot—only the prospect of a further walk back into Oak Creek and the condo at which I was staying. Furthermore, I didn’t want to retreat. I wanted to experience. What am I to do in this situation? Abandon the desert, taking shelter somewhere inside, in an insulated building in which I can’t even here that it’s raining, in which I can forget what the world is doing and instead exist in my own oblivious comfort? Turn my back on the desert when it doesn’t provide my every comfort, a perfect encapsulation of my desires? Or sit on a large rock and welcome the storm, feel the water against my skin, the wind slipping around me, and smell the wetting of the desert rock and sand? I donned my rain jacket and chose the latter, settling myself upon the larger of the two rocks, crossing my legs and facing away from the nearby cliffs, looking out toward Bell Rock, the red ground, and the twisted Junipers. As I sat there, staring out into the desert, the wind blew hard against my back, driving rain against the back of my head. The wind and rain were cold, but not freezing. Rather than discomfort, I felt exhilaration at the power of the weather—the heaviness of the clouds above me, the force of the wind, the abandon of the rain. The water opened up the sands and the desert plants, bringing forth a familiar and comforting scent. I reveled in the fluctuating sensations the storm provided. Rain splattered against the stretch of sandstone in front of me, creating intricate patterns on the rock. As the wind blew, it brought the rain in waves. The waves painted the rocks—a visual representation of the wind pattern. Even as I watched it, though, the sun emerged from behind the patchy storm clouds and shone down as the rain continued to fall, alighting each drop on the stone, illuminating the wind’s pattern. As more rain fell, each hit upon the rocks created a short burst of reflected light and before long I saw the wind’s pattern in the waves of light—a rhythmic pulsing of cold wind and water coupled with the sun’s light, the collaborative art of the elements. It was beautiful. It was a magic, far better than any Christmas light display. I marveled at all this. The visuals, the sensations of the storm against my skin, the sound of the wind flowing across the desert land and through the trees, the push of that wind against my back, the simultaneous chill of the wind and rain on the back of my head and the warmth of the sun on my front. It all came together to create a weaving of contrasts, a heightening of sensation that thrilled me. It awoke and inspired. It lasted long minutes that weren’t long enough. Eventually the squall passed. The wind calmed and the rain trailed off, the sun-accented patterns on the ground drying and disappearing. I sat on the rock for awhile, holding onto and reviewing the memory. I thought of what it meant to be out in that power and restrained fury—at how much of a presence could arise in so little time, uncontrolled by us humans but capable of so much consequence. I recalled that first surprising moment of the rain drop next to the dead scorpion, its sudden appearance at the exact moment I trained my focus on the scorpion shocking me into the present world. I thought about sitting on the rock in the storm and how it might contrast with sitting under a tree, or under a rock ledge, in a yurt where I could hear but not feel the storm, or in an open field. I breathed deep the smell of the wet desert and for a few moments I stared at the cairn on the rock next to me, wondering about the person who had made it, about their love of this particular place. Then I slipped off my rain jacket, returned it to my backpack, shouldered the pack and continued on. I continued following the Llama Trail for awhile until I stopped, pulled a small notebook from my back pocket and a pen from my front, and wrote, No machine, no matter how powerful it makes us feel or how much destruction it lets us wreak, can make us gods. Those machines are as dependent on the wide world as we are, and if we continue to degrade our home, they will fall first—followed shortly by us. No machine is as powerful as that small storm. No human being is as significant. And nothing we’ve ever created is worth disavowing that beauty and power and exhilaration. Sitting on the rock, in that storm, I remembered how small I am as a human on this planet and how big the world is—how huge and daunting and empowering this world is, every day, if only we’ll acknowledge it. Everything we create is a piece of that world. Everything we create is subordinate to it. We need those kinds of storms to remind us of this. But we need them, also, to remind us that such a reality is a good thing. If we could tame such storms through our creations, the world would be a lesser place. If the world was of our making rather than something far larger than us—far more complex, mysterious, magical and incomprehensible—than it would be a lesser place. I’m happy we’re subordinate to the world and not the other way around. I’m comforted by it, in fact. It means that there will always be those moments when the world takes me over, surprises me, asserts itself in the most unexpected of moments and makes me remember who I am, where I am, and how little I know. It can be just a rain drop, at just the right moment. It can be the art of sun and wind and rain. It can be hot and cold at the same time—front and back, two powers meeting. It can be the world, finding me on a desert afternoon, out on the rocks with nowhere to go. But it’s all beauty, and power, and magic, and appropriate. And I’m thankful that I was there that afternoon, that I saw the world’s beauty in a way I never had before. I’m thankful to have been reminded in that moment of how small I am and how large and unexpected the world is. I’m thankful for what the desert told. This is Part Three of the How To Be Poor introduction. Read Part One and Part Two. I have not been living poor the last few days. In fact, I’ve been living . . . well, if not quite rich by American standards, then at least upper middle class. It hasn’t been with my money, though, which is the only reason I’ve been able to do it. My mother rented a place in Sedona, Arizona for the month and asked me if I would help her drive down from Portland. Having missed the Arizona desert in the last few years and having a flexibility in my life and work that allows for such a prolonged trip, I took her up on the offer, with the one alteration being that I would return on the train rather than by air. With plans thus set, we departed on Sunday and, over the next three days, drove the 1,400 miles here to red rock country, where I’m now staying until next Sunday. As I noted, this has not been a life of poverty the last few days. Not only have we driven 1,400 miles, with all the attendant gasoline costs that entails, but we’ve also eaten out several times, to the point that I very fast became sick of the bread-and-meat meals of roadside diners. I also grew tired from the driving—I ended up doing all of it, which was fine by me, but one grows a bit weary after eight or nine hours straight of being on the highway. By the time we would stumble into our motel room in the evening, I wanted little more than to pass out on one of the room’s uncomfortable beds, allowing my body a recharge from an exhaustion that only the most brutal day of farming could recreate. On the third day of driving, just after some meat and bread at a cafe in Needles, I decided to depart Interstate 40 in favor of a stretch of Route 66 that travels about 45 miles between Topock Bay, through the blatant tourist trap of Oatman (complete with a significant herd of tame burros milling about in the road) through the Black Mountains and over the beauty of Sitgreaves Pass, and then back to I-40 near Kingman. Now, I suspect most people reading this have at least heard of Route 66, whether or not you’re particularly familiar with it. Suffice it to say, Route 66 holds a certain significance in the American consciousness. It stretched from Los Angeles to Chicago and was the first highway to be fully paved in America. It assisted the migration of farmers devastated during the Dust Bowl, provided business to towns during the Great Depression, and abetted economic migration during World War II. Route 66, however, truly reached its zenith as the romantic epitome of happy motoring during the 1950s, as it became the route to Los Angeles for vacationing families. The increased traffic saw the rise of the sort of roadside attractions now considered gloriously kitschy and a throwback to the height of Americana, helped to spawn the fast food industry, and further cemented the car as the center of American life. While I had to do a bit of research to come up with that fairly straightforward summary of Route 66, I didn’t need Wikipedia to feel the allure of Route 66 while driving East through Southern California and into Arizona. Every time I saw one of those brown signs noting access to Historic Route 66 at the next exit, I wanted to veer off onto that potholed, two-lane road, drop the windows, put my arm out into the wind and rocket toward my destination. Despite knowing that the road would be rough, the towns would be dead and devastated, and that the route no longer held the distinctly American romanticism of car culture, I couldn’t help but be called by the cultural heritage of the road—by that American obsessiveness over the car, that ideal of paved freedom. I wanted off that easy Interstate and onto something gritty and real and wide open—Route 66, promising a freedom and glory found nowhere else. How did I get sucked into this ideal? I don’t know, to be honest. But I’m sure it came out of a combination of growing up immersed in American popular culture and spending significant amounts of time in automobiles. While I never watched the show, I certainly am familiar with the song. I saw Cars, as mediocre a film as it was, and my heart did soar at the site of those anthropomorphized automobiles zooming through the Arizona desert. I lived for a year in Arizona when I was sixteen, and during that time I took multiple road trips through that same desert with my mother, in her beat up but faithful white pickup. Every time we crested a small rise and saw the road unfurling for miles before us, the desert stretching out impossibly far on each side, I couldn’t help but feel an intoxicating joy and freedom. All those cultural impressions and personal experiences with road trips no doubt brewed themselves into an emotional stew in which the ideal of Route 66—particularly its Arizona stretches—served brilliantly as the main ingredient. So during our stop for lunch in Needles, looking over the road map and seeing that stretch of Route 66 winding its way through the Black Mountains, I couldn’t help but divert into what seemed a promising adventure. We zipped a few miles down I-40 and then exited off onto Route 66. Off the Interstate and therefore no longer doing 80mph, I cranked down the window to enjoy the warm air and began the slowed drive, going about 45, waiting for the romanticism to wash over me. What happened instead in those first few minutes was a significant adjustment period. After doing nearly twice that speed, 45mph seemed plodding to me, and I had to resist the urge to rev up the engine and shoot down the road at a considerably higher speed. Before long, another car came up behind me wanting to go faster and this proved annoying, having to deal with the vagaries of another human being’s desires, rather than having multiple lanes and light enough traffic to rarely be impeded or pressured by another—to have all the easy whims of my exact desired usage of my machine satisfied. Eventually, the motorist passed me on a straightaway, and I relaxed a bit. The road was bumpy, of course, as opposed to the smooth ride of the Interstate. It twisted and turned and wound around, rarely taking the fastest route and often traveling with the land. There were multiple points at which washes simply went over the road, meaning the road would be flooded during rainstorms. Yellow signs helpfully suggested that drivers not enter into the wash when it was flooded. The road felt in many ways a part of the landscape. Rather than being raised and separated and cutting harsh through the land as the Interstate did, it meandered with the counters of the hills and the sides of the road seemed to fade and disappear into the desert sand and rock. The protection was minimal—the road expected a certain level of competence and attention. While there’s a certain thick irony in relating the transition to poverty as a response to peak oil with the transition from an Interstate to an old section of Route 66, I intend to do just that. As I drove along Route 66, I couldn’t help but see the parallels. The Interstate provided the height of modern transportation convenience. It traveled more often than not in a straight line, was paved smooth, was elevated and separated from the land and, indeed, dominated the land. It provided for a very high speed of travel and, as such, I traveled the road with the windows up, with a full enclosure and separation from the landscape and climate around me. The multiple lanes and relatively sparse traffic allowed me a high degree of separation from other drivers, allowing me to mostly keep the exact speed I wanted and not to be impeded or pressured by drivers going too slow or fast for my taste. The highway was dotted with convenient rest areas and continual access to restaurants, fuel stations and other businesses. The Interstate coddled its passengers, providing for everything at all points, and demanding the least amount of attention and foresight as possible. The old Route 66, on the other hand, worked with the land. It meandered and presented constant sharp turns and curves, blind corners, washes that could flood the road, often a lack of guardrails, and few sections that were straight and smooth. It was bumpy and rutted and provided a basic form of transport, at least in today’s terms. Compared to the Interstate, it was not particularly fast or efficient. At best, I would creep up to 50 or 55, rather than 80, and getting from point A to point B was a windy affair. At times, I had to come to a complete stop to allow for a bored burro to stare at my car indifferently (and that, I must admit, was one of the best moments of the detour.) Imagine coming to a full stop on the Interstate. It’s essentially unthinkable. Route 66 assumed a certain amount of skill and attention, and failed to coddle the driver at every turn. The availability of fuel and food and services along that stretch of the old route was minimal and the only rest area was in Oatman. There was, however, the occasional shoulder to pull off of and plenty of desert ground upon which to pee, should one need to do such a thing. This all took some getting used to after traveling somewhere around 1,000 miles along the coddled reality of the Interstate. Dropping from 80mph to 45mph proved annoying and frustrating at first, as I had to adjust to a speed that, while fast, seemed interminably slow at first glance. The first few miles of the transition, I couldn’t help but feel like it was taking too long to get where I was going. But as the beauty of the landscape washed over me and my speed transitioned from an impediment to a luxury, I began to appreciate the moment. My speedometer dropped from 45 to 40, and then down to 35. Eventually I was driving at 30mph, and I didn’t give a damn if I ever returned to the Interstate. The landscape called to me, the fresh air felt glorious, and eventually I just decided to pull over to the side of the road and actually take a few minutes to revel in the beauty around me and not to worry about getting to where I was going. I was already somewhere beautiful—why did I need to get farther down the road? Moving from the Interstate to 66 took a few moments of transition and required some reorientation of my thinking, but once I did that, I fell in love with my new reality. I gloried in the beauty and joy of it, in the easy relaxation that came with not desperately trying to accomplish something so much as appreciating the present reality. And that’s a definite parallel to the transition to a life of poverty. You can’t go into it expecting the same sort of happiness and comfort and satisfaction that a middle class lifestyle offers. You can’t, in other words, get on Route 66 and expect to go 80, and to have to keep your window rolled up, and desire a smooth ride. You’ll be disappointed. But if you roll down the window and take in the fresh air, slow down and enjoy the views of the landscape, and marvel at the way the road blends into the landscape rather than dominating it, you’re going to find new sorts of joys, and you might find they’re better than the old ones. Writing about that sort of transition—that altering of one’s mind frame—is going to be the main focus of the How To Be Poor series. The reason for this is twofold. First of all, I think that’s the more interesting aspect of living in poverty, and I think it’s the more important aspect of it. While the actual practices and realities of poverty are a huge piece of such a life, so too is the mental and emotional frame of mind if you’re coming from a position of not living in poverty. In many ways, that’s what provides much of the challenge—learning to let go of that previous way of life and figuring out how to derive your joy and happiness and comfort in entirely new ways. Second of all, I’ll be writing about the theory of poverty because I have minimal experience with the hard realities of living in poverty. I’m still figuring all that out and so I don’t want to start throwing out untested ideas and applications and claiming them to be an effective framework for living in poverty. That strikes me as an unhelpful approach, and an arrogant one. That doesn’t mean, on the other hand, that there won’t be practical information in future posts. But my current plan is to put most of that in The Household Economy posts (that introduction coming soon.) I’ll be writing about my gardening and homesteading activities in that category, as well as any salvaging or working with salvaged materials. I hope and expect that information and those stories will prove helpful, but they will be the stories of someone still very much figuring out how to live poor, and how to do it effectively. Their value, therefore, will be in shared trial and error more than in experienced instruction. In conclusion to this introduction to the How To Be Poor series, I want to be very clear about where I’m coming from in regards to my own experience of voluntary poverty. I do this for multiple reasons. First of all, I’m new to this as a conscious project, though I have been scaling back my life for a few years now. I want it to be clear that I’m writing not as someone who is experienced and practiced with living in poverty, but as someone who is struggling with that transition. I suspect that will be helpful for many of you, as I suspect that many of you aren’t particularly poor. For those of you who are already poor, I hope that what I write will prove helpful, anyway, and that I won’t embarrass myself in the process. That brings me to another reason to be explicit about my poverty—which is that I’m not particularly poor. Granted, I do make an income that is officially below the line of poverty, but I still maintain access to too many comforts to consider myself truly poor. I am not living in poverty the way millions of people in this country live in poverty, or the way in which billions throughout the world do. I don’t lack for food or water, for housing and shelter, for good work, or even for entertainment. All of this is available to me and I partake in all of it. I own a car and I can buy gas for it. I have credit cards, and tens of thousands of dollars in available credit (though I don’t intend to use that.) I have family and friends who would take me in should I ever find myself in a much worse financial system. I have a level of security and comfort that simply belies the idea that I am truly living in poverty. And that’s why I’m writing about voluntary poverty. That is most certainly what I’m participating in here, not in any sort of forced poverty. As such, I want to further enumerate my reality a bit, just to be as explicit as possible. Here are the raw numbers. I made about $800 in January, which seems rich to me. In the context of the world, of course, that is rich. I have about $6,000 in credit card debt and over $10,000 in student debt. I plan to pay off the credit card debt over the next 12-18 months, if all goes well. I have no idea when and if I’ll ever pay off the student debt. I have over $3,000 in the bank. I own my car out right, but I worry it’s in need of some repair. I pay $325 in rent. Soon, I’ll be doing work-trade for my rent. I’ll write more about that in a future post. Aside from the numbers, I live well. My current residence is a 12 foot diameter yurt, and I love it. Eventually it will be a couple rooms in a studio house on a different farm. I have a good amount of kitchen gear, more books than I can read, plenty of clothes, some good shoes, a laptop, a cell phone, good beer to drink, great food to eat, and more. I have a level of luxury and comfort available to me that is quite impressive, even though I have a small income. I also live alone, and don’t have to support or help support anyone else. When I write about my voluntary poverty, to again be clear, I am writing about it in the sense of someone who has mostly lived a middle class, comfortable existence and who is now attempting to scale back to something resembling a comfortable and happy poverty. That strikes me as a very complicated goal, but it’s the one before me. But I am not struggling to put food on my plate, or keep a roof over my head, to escape the elements or find work. I have two jobs. I have comfort and security. Yes, that could go away at some point, but for the time being I feel good about my future. My goal is to ratchet back a bit more all the time, to learn to live with as little as possible, to turn comfort into discomfort and learn how to make that discomfort comfortable. This is voluntary, and I am lucky. And so this series will be about changing my frame of mind, shedding the trappings of wealth, figuring out the most simple and basic comforts, and lessening my dependence on money and machines and the traditional economy. This will be about discovering my humanity, opting out of the industrial society as much as I can, and preparing for a much more harsh and trying future. It will also be about finding the joy in all of this, and acknowledging the challenges and hardships, and hopefully this series won’t slip into something insulting to people who are experiencing true, involuntary poverty. That’s one of my greatest concerns here, that I don’t act blithe in the face of all those who experience a poverty that I’ve never come close to experiencing. This is going to be, then, about me attempting to learn well how to be poor, to share the attitudes and ideas that strike me as particularly helpful, and hopefully to get some good advice and feedback from readers. As such, I encourage comments and have been heartened and grateful for the comments already received. I think there’s a lot of value in the work of learning to be poor. I hope, ultimately, that this series reflects that, helps bring a few of you along the path with me, and facilitates others sharing their knowledge with me and other readers here.